It seems that patients with schizophrenia are not benefitting similarly in the declining morbidity and mortality seen in the general population. In fact, the average life expectancy for patients with schizophrenia has been 55-60 years through the last generations in Denmark, while the general population over the same period of time has experienced an increase in life expectancy (Laursen et al., 2013). As a result, the standardized mortality rate for patients with schizophrenia has increased markedly over the last three decades and is currently a major public health concern (Saha et al., 2007). It is well-known that suicide has been the leading cause of death in patients suffering from schizophrenia. However, recent studies have shown that the excess mortality is more caused by somatic diseases, especially cardiovascular disease, pulmonary disease and diabetes mellitus (Laursen et al., 2011; Scherr et al., 2012; Nielsen et al., 2013; Correll et al., 2014). Reasons explaining the excess somatic comorbidity and mortality may be related to the unhealthy lifestyle in people with schizophrenia, including poor diet, lack of exercise, high rate of smoking and substance abuse, as well as side-effects of the pharmacological treatment (Scherr et al., 2012; Correll et al., 2014). As a result of unhealthy lifestyle behaviors, patients with schizophrenia often present with metabolic syndrome. A recently published cross-sectional study of antipsychotic-treated patients showed that 48% of these patients presented with metabolic syndrome compared to 29% in the general population (Krane-Gartiser et al., 2011). Metabolic syndrome is known to be a major risk factor for developing cardiovascular disease, and consequently cardiovascular disease is the leading cause of death in patients diagnosed with schizophrenia (Capasso et al., 2008; Finegold et al., 2013). However, the relative risk of cardiovascular disease in patients with schizophrenia is about 2-fold higher than in the general population (Hennekens et al., 2005). While the general population has experienced a gradual decline in cardiac mortality due to the improvements in cardiac treatment and adjustments in lifestyle, it seems that patients with schizophrenia are not benefiting similarly from these improvements (Laursen et al., 2013; Singh et al., 2014). Little is known about more severe progression of premature coronary arteriosclerosis in patients suffering from schizophrenia. For example, coronary artery calcium score (CACS) is often used to predict cardiovascular disease events in the general population (Polonsky et al., 2010). It is still not known whether there is an association between CACS and premature morbidity and mortality in patients with schizophrenia. The quantity of coronary artery calcium is a well-recognized measurement to validate the presence of arteriosclerosis, and even smaller amounts of calcium in the arteries are correlated to increased cardiac mortality as well as all-cause mortality (Shaw et al., 2003; Budoff et al., 2007). The present clinical trial involves a variety of somatic investigations as well as a thorough characterization of the psychiatric disease in two cohorts of patients suffering from debut respective chronic schizophrenia, and involves planned follow-ups every third year. Yet, to our knowledge, this clinical trial is the first study that offers an extensive cardiac examination and treatment based on biomedical markers for cardiovascular disease in patients diagnosed with schizophrenia. The aim of this study is to reduce the high cardiac mortality rate in patients suffering from schizophrenia. In order to achieve this aim, we will measure the presence and progression of arteriosclerosis in patients with schizophrenia at different stages. Furthermore, we will develop and implement adequate intervention and treatment for these patients according to their somatic condition. The results might provide important modifications in the clinical guidelines for treatment of coronary artery disease in patients diagnosed with schizophrenia. We hypothesize that patients with schizophrenia have a significant higher calcium score in coronary arteries and have a more rapid arteriosclerosis progression than the general population. In addition, we hypothesize that patients with schizophrenia have early non-detected signs of arteriosclerosis, which can be detected by non-invasive methods. 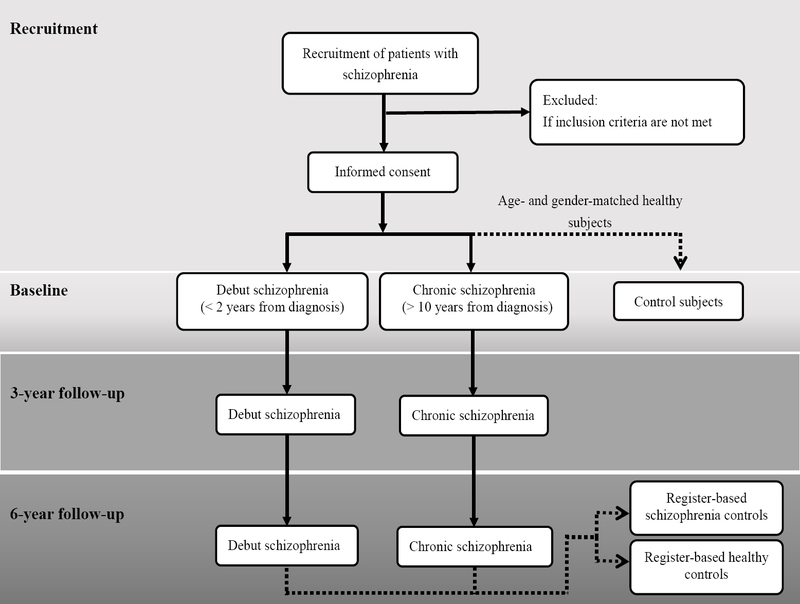 A prospective clinical cohort study with follow-up every third year in patients diagnosed with schizophrenia with register-based and clinical comparison groups ([Figure 1]). This study protocol is approved by The Regional Committee on Biomedical Research Ethics, Region of Northern Jutland, Denmark and the Data Protection Agency of Denmark. The study is performed in accordance with the Declaration of Helsinki, and written informed consent will be collected from each study participant prior to enrolment. All examinations will be conducted at the Centre for Psychosis Research, Aalborg University Hospital, Psychiatric Hospital, Aalborg, Denmark and at the Department of Cardiology, Aalborg University Hospital, Aalborg, Denmark. A total of 300 patients with schizophrenia are planned to enroll in this clinical study. We use the 10 th version of International Classification of Disease (ICD-10) (World Health Organization (WHO), 2011) for the diagnosis of schizophrenia of which we use the codes (F20 and F25). The duration of the mental illness is categorized into debut and chronic schizophrenia. Patients are categorized as debut schizophrenia when the first time diagnosis (F20/F25) is received within the last 2 years from the time of inclusion. Criteria for being classified as chronic schizophrenia is that patients for more than 10 years have had diagnosis within the schizophrenia spectrum disorder (F20/F25), and at the time of inclusion have a diagnosis of either F20 or F25. A total of 100 debuting patients with schizophrenia and 200 chronic patients with schizophrenia will be recruited for this trial. All participants are planned to provide a follow-up every three years after the first examination. An age- and gender-matched control group will be recruited for both the debut schizophrenia patients and the chronic schizophrenia patients. Whereas two register-based control group will be extracted for both groups using the Danish registers; 1) Schizophrenia controls extracted from the Danish Psychiatric Research Register, including age, gender and diagnosis matched, 2) healthy controls with no history of mental illness extracted from the Danish Civil Register including age and gender matched. Thus, a total of 100 gender- and aged-matched healthy control subjects are invited to participate in this comprehensive cardiac screening program and receive the same thorough cardiac examination program as for schizophrenia patients. Participants with previous history of mental disorders or congenital heart disease are excluded before initiation. Patients will be withdrawn from the study if they withdraw informed consent and decline to continue examination. A screening list of patients diagnosed with schizophrenia is initially conducted. All of these patients receive a letter with information about this clinical study and are asked whether they would like to participate. To ensure a sufficient number of patients, each unresponsive patient will be contacted by phone and asked whether they would like to receive further information regarding this clinical study. Presentations about this study are given at each community mental health places, psychiatric hospital departments and outpatient clinic in the North Denmark Region to inform both patients and health professionals. The primary outcome measure is an assessment of the extent and progression of arteriosclerosis using CT coronary angiography measured at baseline and every 3 years. 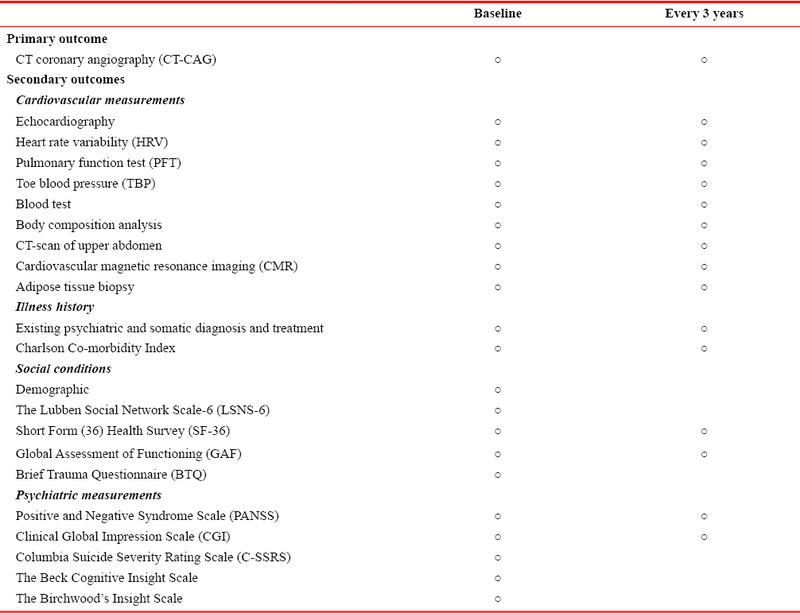 The secondary outcomes are cardiovascular measurements, illness history, social conditions, and psychiatric measurements ([Table 1] and [Table 2]). Each of the social and psychiatric scales used in this study are further described below. The LSNS-6 is a self-report questionnaire measuring social isolation, including relations to family and friends. This is a 6-item scale with a score ranges between 0 and 60, with lower score indicating more social isolation. It is a useful tool to assess the relation to others when first considering the people to whom the patient is related either by birth or marriage or the friends including relation to neighbors (Lubben, 1988). The SF-36 is a self-report short-form health survey with 36 questions of functional health and psychometric based summary of the patient's well-being (Bjorner et al., 1998). This measure is useful to estimate disease burden and compare it with the general population. The GAF scale is a clinical evaluation of the patient's overall functioning level, including psychological, social and interpersonal, and occupational functioning of mental health-illness. The scale ranges from 0 to 100 with higher number indicating superior functioning (Hall, 1995). The BTQ is a self-report questionnaire consisting of 10-items. The questionnaire is used to determine any traumatic events experienced and respondents are simply answering "yes" or "no" to the questions. It is useful to screen for many different types of traumatic episodes, including serious car accidents, violent death, life-threatening illness, and physical or sexual abuse (Kubany et al., 2000). The PANSS is among the most used measure of symptom severity in schizophrenia and comprises a 30-item scale with focus on two distinct syndromes. The positive syndrome includes productive symptoms, and the negative syndrome, includes deficit features. This method is useful to implement treatment plans for the specific patient based on the symptoms. The minimum total score is 30 and maximum total score is 210 (Kay et al., 1987). The CGI is a 3-item scale used to measure symptom severity, therapeutic response and general improvement. The first item is evaluating severity of psychopathology on a 7-point scale, and second item evaluating the change from the initiation of treatment on a similar 7-point scale. Item 3 is rated on a 4-point scale, and each item is rated individually (Rush and Blacker, 2008). The C-SSRS is used to predict suicide attempts in individuals with severe mental illness. It is extensively used in clinical practice, research, and institutional settings. The suicidal ideation or behavior of the patient is reflected by the judgement of the health professional administering the scale (Gipson et al., 2015). The Beck Cognitive Insight Scale is used to describe the capacity of patients with episodes of psychosis to distance their thoughts from their psychotic experiences. The questionnaire is a 15-item self-report with a 9-item self-reflectiveness element and a 6-item self-certainty element. It is a helpful tool to describe the lack of awareness of mental illness and understand the patients' interpretations of their experiences (Beck et al., 2004). The Birchwood's Insight Scale is a self-report questionnaire consisting of eight statements that patients rate on a 3-point scale (agree, not agree or uncertain). It is designed to detect the awareness of illness, awareness of need for treatment and the ability to relabel symptoms (Sanz et al., 1998). All data will be collected in case report forms for each patient, including data obtained from the objective clinical examination. All data are planned to be entered into an electronic database by double entry from two independent researchers. All information obtained in this study will be preserved by Aalborg Psychiatric Hospital and Department of Cardiology at Aalborg University Hospital, Aalborg, Denmark. Power estimates in clinical cohorts are often associated with a degree of uncertainty. To date, no other studies have measured the coronary artery calcium score in patients with schizophrenia. Recent studies have shown that progression of coronary atherosclerosis occurs in 20-30% of patients in the general population (Bayturan et al., 2010; Han et al., 2014). Since the prevalence of metabolic syndrome in patients with schizophrenia is much higher than in the general population, we hypothesize that the coronary atherosclerosis progression in patients with schizophrenia is 55-60%. Furthermore, it is well-known that metabolic syndrome and the amount of calcium in coronary arteries increase with age. Based on these assumptions, a study cohort of 200 patients with chronic schizophrenia and 100 patients with debut schizophrenia will be recruited. However, when 50 patients with debut schizophrenia and 100 patients with chronic schizophrenia have been enrolled in the study, an independent statistician will calculate a new power estimate to ensure a sufficient number of patients to recruit. Each analysis is initiated by descriptive statistics to compare schizophrenia groups with the control groups at baseline and end of the follow-up period. The response rate at the different time points in the follow-up periods will be compared between all study groups for each of the outcomes studied ([Table 1]). The Student's t-test is used to compare normally distributed nominal variables between groups. While the Mann-Whitney U test and Wilcoxon test are used to compare variables between groups if data is non-normally distributed. Wilcoxon test will also be used to determine the intra-group differences at different time points. The chi-square test or Fisher's exact test are used to determine associations between categorical variables. In addition, predictive analysis is conducted using logistic regression. Significant effect is accepted if the P-value is < 0.05. Statistical analyses are performed with either STATA 14.0 or SPSS 24.0 software. This is the first clinical study to offer a routine screening of cardiovascular risk factors in patients with schizophrenia. There are numerous studies highlighting that cardiovascular disease is responsible for the premature mortality observed in this patient group. However, to date there has not been any success in the attempt to reduce this high cardiac mortality in clinics. This clinical screening will assist early identification of cardiovascular disease and progression. The progression of arteriosclerosis in patients with schizophrenia will be investigated at early and late stage of the mental illness, which allow us to understand at what stage this progression might prevail. We are investigating whether it is possible to detect differences in the development of arteriosclerosis in schizophrenia patients compared to the general population, and how common risk factors are contributing to this process. If we detect any differences, we will be able to offer treatment and intervention to these patients. Thus, the main goal in this trial is to reduce the high cardiac mortality in patients with schizophrenia and provide new knowledge to the clinical practice. Some limitations are associated with this clinical trial. For instance, it is a well-known fact that treating patients with schizophrenia is a challenge in clinical trials due to the complexity of the disease affecting cognition, behavior, mood, and motivation. Especially cognitive disturbances and reduced understanding of symptoms and signs in their psychiatric and somatic disease symptoms are very common (Hillege, 2013). Since this clinical study involves a great number of measurements, there might be individual differences in the time to complete each measurement. For example, some patients will need more freedom during a clinical trial to handle their cognitive disturbances or carry out routine tasks, while others will be able to complete the clinical trial without any delay. Also, these patients tend to forget appointments, which is handled by continuous reminders during the time before initiation and by the support from their community mental health nurse who visited them at their home. Bayturan O, Kapadia S, Nicholls SJ, Tuzcu EM, Shao M, Uno K, Shreevatsa A, Lavoie AJ, Wolski K, Schoenhagen P, Nissen SE (2010) Clinical predictors of plaque progression despite very low levels of low-density lipoprotein cholesterol. J Am Coll Cardiol 55:2736-2742. Beck AT, Baruch E, Balter JM, Steer RA, Warman DM (2004) A new instrument for measuring insight: The Beck Cognitive Insight Scale. Schizophr Res 68:319-329. Bjorner JB, Thunedborg K, Kristensen TS, Modvig J, Bech P (1998) The Danish SF-36 Health Survey: Translation and preliminary validity studies. J Clin Epidemiol 51:991-999. Budoff MJ, Shaw LJ, Liu ST, Weinstein SR, Mosler TP, Tseng PH, Flores FR, Callister TQ, Raggi P, Berman DS (2007) Long-term prognosis associated with coronary calcification. Observations fom a registry of 25,253 patients. J Am Coll Cardiol 49:1860-1870. Capasso RM, Lineberry TW, Bostwick JM, Decker PA, St. Sauver J (2008) Mortality in schizophrenia and schizoaffective disorder: An Olmsted County, Minnesota cohort: 1950-2005. Schizophr Res 98:287-294. Correll CU, Robinson DG, Schooler NR, Brunette MF, Mueser KT, Rosenheck RA, Marcy P, Addington J, Estroff SE, Robinson J, Penn DL, Azrin S, Goldstein A, Severe J, Heinssen R, Kane JM (2014) Cardiometabolic risk in patients with first-episode schizophrenia spectrum disorders: baseline results from the RAISE-ETP study. JAMA Psychiatry 71:1350-1363. Finegold JA, Asaria P, Francis DP (2013) Mortality from ischaemic heart disease by country, region, and age: Statistics from World Health Organisation and United Nations. Int J Cardiol 168:934-945. Gipson PY, Agarwala P, Opperman KJ, Horwitz A, King CA (2015) Columbia-suicide severity rating scale: predictive validity with adolescent psychiatric emergency patients. Pediatr Emerg Care 31:88-94. Hall RC (1995) Global assessment of functioning. A modified scale. Psychosomatics 36:267-275. Han Y, Jing J, Tu S, Tian F, Xue H, Chen W, Chen J, Reiber JH, Chen Y (2014) ST elevation acute myocardial infarction accelerates non-culprit coronary lesion atherosclerosis. Int J Cardiovasc Imaging 30:253-261. Hennekens CH, Hennekens AR, Hollar D, Casey DE (2005) Schizophrenia and increased risks of cardiovascular disease. Am Heart J 150:1115-1121. Hillege H (2013) Issues in clinical trial analyses. Slides:1-7. Kay SR, Fiszbein A, Opler LA (1987) The positive and negative syndrome scale (PANSS) for schizophrenia. Schizophr Bull 13:261-276. Krane-Gartiser K, Breum L, Glümrr C, Linneberg A, Madsen M, Køster A, Jepsen PW, Fink-Jensen A (2011) Prevalence of the metabolic syndrome in Danish psychiatric outpatients treated with antipsychotics. Nord J Psychiatry 65:345-352. Kubany ES, Haynes SN, Leisen MB, Owens JA, Kaplan A, Watson SB, Burns K (2000) Development and preliminary validation of a brief broad-spectrum measure of trauma exposure: the Traumatic Life Events Questionnaire. Psychol Assess 12:210-224. Laursen TM, Munk-Olsen T, Gasse C (2011) Chronic somatic comorbidity and excess mortality due to natural causes in persons with schizophrenia or bipolar affective disorder. PLoS One 6:e24597. Laursen TM, Wahlbeck K, Hällgren J, Westman J, Ösby U, Alinaghizadeh H, Gissler M, Nordentoft M (2013) Life expectancy and death by diseases of the circulatory system in patients with bipolar disorder or schizophrenia in the Nordic countries. PLoS One 8:4-10. Lubben J (1988) Assessing social networks among elderly populations. Fam Community Heal 11:42-52. Nielsen RE, Uggerby AS, Jensen SOW, McGrath JJ (2013) Increasing mortality gap for patients diagnosed with schizophrenia over the last three decades - A Danish nationwide study from 1980 to 2010. Schizophr Res 146:22-27. Polonsky TS, McClelland RL, Jorgensen NW, Bild DE, Burke GL, Guerci AD, Greenland P (2010) Coronary artery calcium score and risk classification for coronary heart disease prediction. JAMA 303:1610-1616. Rush AJ, Blacker D (2008) Handbook of psychiatric measures. American Psychiatric Publishing, Inc.
Saha S, Chant D, McGrath J (2007) A systematic review of mortality in schizophrenia: is the differential mortality gap worsening over time? Arch Gen Psychiatry 64:1123-1131. Sanz M, Constable G, Lopez-Ibor I, Kemp R, David AS (1998) A comparative study of insight scales and their relationship to psychopathological and clinical variables. Psychol Med 28:437-446. Scherr M, Hamann M, Schwerthöffer D, Froböse T, Vukovich R, Pitschel-Walz G, Bäuml J (2012) Environmental risk factors and their impact on the age of onset of schizophrenia: Comparing familial to non-familial schizophrenia. Nord J Psychiatry 66:107-114. Shaw LJ, Raggi P, Schisterman E, Berman DS, Callister TQ (2003) Prognostic value of cardiac risk factors and coronary artery calcium screening for all-cause mortality. Radiology 228:826-833. Singh JA, Lu X, Ibrahim S, Cram P (2014) Trends in and disparities for acute myocardial infarction: an analysis of Medicare claims data from 1992 to 2010. BMC Med 12:190. World Health Organization (WHO) (2011) ICD-10 Transition. Fam Pract Manag 18:39.